Portioned coffee in capsules for modern automatic coffee-making machines are becoming increasingly popular. The production of coffee capsules goes hand in hand with strict requirements regarding precision and constant product quality. Our thermoformers guarantee exactly this quality for virtually all kinds of coffee capsules – with or without hole punching. Our machines reach output volumes of up to 140,000 coffee capsules per hour depending on the model. Thanks to the high precision of our technology, you can produce your capsules in exactly the form you wish. Our thermoformers achieve an extremely even spread of the plastic over the whole capsule form. 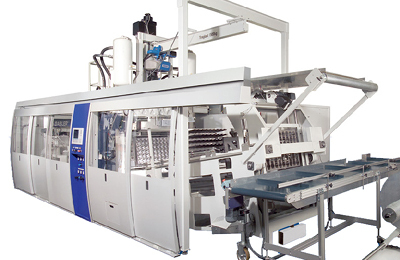 With our machines, you can easily produce capsules with special wall characteristics and high-precision hole punching. Produce the right coffee capsule for coffee machines or fully automatic coffee machines. 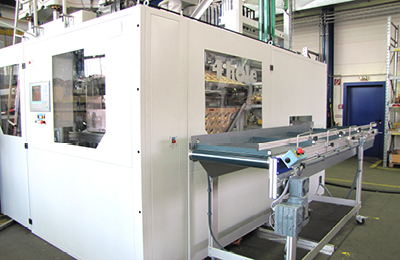 The thermoformers in our M-LINE in combination with the hole puncher/stacking unit 4hole are the ideal production solution for your demands. The M-LINE features convincing high productivity, innovative drive technology, particular stability and ease of use. Particularly the removal system for tools and insertion in the transport pallets was continually further developed. Our hole puncher/stacking unit 4hole transports the formed capsules directly to pallets after the forming station and ensures precise hole punching in the puncher. The offcuts occurring are removed by the lower tool by suction. As an option, a camera system takes over quality control at the quality station. The punched capsules are transported by pallets to the stacking unit where they are stacked and counted before being finally shunted away by a conveyor.